How to navigate up a folder? It is very easy to navigate to up a folder in each explorer View of the Quad-Directory Explorer! >to 4: "Menu" > "List View"
>to 5: "Menu" > "Address Bar"
(Image-1) navigate up a folder level in Q-Dir! 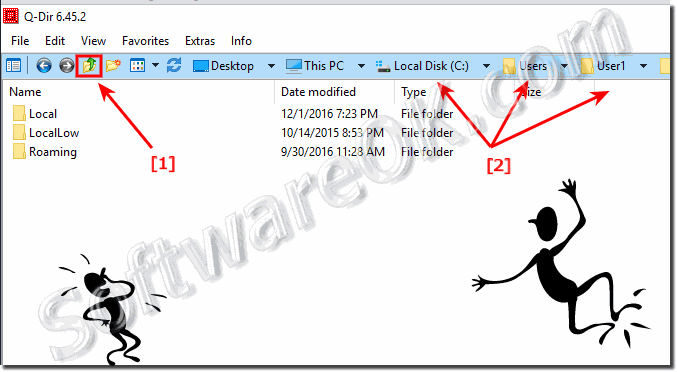 Q-DIR - FAQ-53: How to navigate up a folder? Is there the Quad-Directory File Manager for Linux or Mac OS X? If some of the explorer windows have 1 or more tabs, easy remove them ergo close the tabs and define a default folder when open new Tab Content: 1.